TV show dates: June 21, 2015 — present. 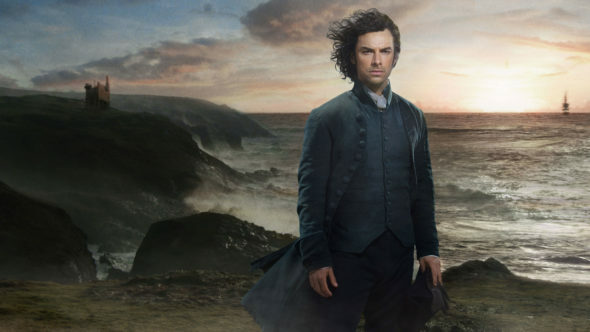 Performers include: Aidan Turner, Eleanor Tomlinson, Heida Reed, Jack Farthing, Kyle Soller, Ruby Bentall, Warren Clarke, Phil Davis, Beatie Edney, Alexander Arnold, Robert Daws, Tristan Sturrock, Caroline Blakiston, Luke Norris, John Hollingworth, Gabriella Wilde, Ed Browning, Richard Hope, Pip Torrens, and Richard Harrington. From creator and writer Debbie Horsfield, the Poldark TV show is a historical drama, based on the series of novels by Winston Graham. The story centers on Ross Poldark (Turner). In 1783, he returns to Cornwall from the American War of Independence, to find his father has died, and his estate is in tatters. Ross is a study in contradictions. Although he has little use for authority, he’s a firm believer in justice. Despite being principled and steadfast, he’s prone to erratic behavior and taking risks. While many look up to Ross he has his detractors, regardless of his no-nonsense charm. He also finds his loyalties divided between two women. Elizabeth (Reed) was once enaged to Ross, but after he was rumored dead for years, she accepted the proposal of his cousin, Francis (Soller). Although she dearly wants to remain faithful to her betrothed, Elizabeth wonders if going ahead with the marriage is a mistake. Francis is not nearly as adept at business as his father, Charles (Clarke), who knows his heir is less capable than Ross. Keenly aware that Elizabeth still has feelings for his cousin, Francis turns to gambling and drinking, to numb his feelings of inadequacy. By hiring her as his kitchen maid, Ross rescues Demelza Carne (Tomlinson) from a harsh life. She is the only daughter of a poor, callous, alcoholic miner. Despite her tough background, she is lively, inquisitive, and self-reliant. Eventually, Ross recognizes her for the beautiful woman she is. Although they got their start as blacksmiths, the Warleggan family has risen in terms of both wealth and power. Son George is now a banker with big dreams, who won’t let petty things like friendships hinder his climb. Can Ross reestablish himself, find true love, and reclaim his family legacy? Will he manage to stave off greedy George, wrest control of the local mines, and help the village? Stay tuned. What do you think? Do you like the Poldark TV series? Should this TV show be cancelled or renewed for another season on PBS? I love the show and can hardly wait for the new season!